The impact of public narratives has been so broad (including effects on beliefs and behavior but extending beyond to emotion and personality), that the stakeholders in the process have been located across disciplines, institutions, governments, and, indeed, across epochs. Narrative Impact draws upon scholars in diverse branches of psychology and media research to explore the subjective experience of public narratives, the affordances of the narrative environment, and the roles played by narratives in both personal and collective spheres. 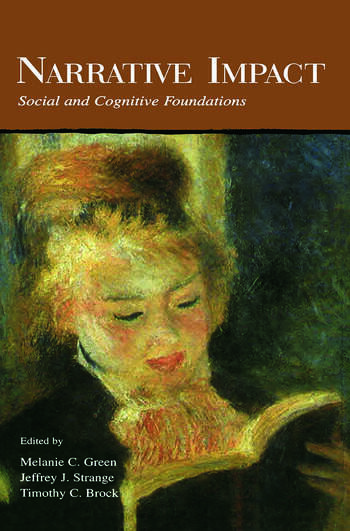 The book brings together current theory and research presented primarily from an empirical psychological and communications perspective, as well as contributions from literary theory, sociology, and censorship studies. To be commensurate with the broad scope of influence of public narratives, the book includes the narrative mobilization of major social movements, the formation of self-concepts in young people, banning of texts in schools, the constraining impact of narratives on jurors in the court room, and the wide use of education entertainment to affect social changes. Taken together, the interdisciplinary nature of the book and its stellar list of contributors set it apart from many edited volumes. Narrative Impact will draw readership from various fields, including sociology, literary studies, and curriculum policy. *addresses the growing blurring of fact and fiction: mechanisms and implications for beliefs and behavior. Contents: M.K. Johnson, Foreword. Preface. T.C. Brock, J.J. Strange, M.C. Green, Power Beyond Reckoning: An Introduction to Narrative Impact. Part I:The Experience of Stories. V. Nell, Mythic Structures in Narrative: The Domestication of Immortality. K. Oatley, Emotion and the Story Worlds of Fiction. J.W. Polichak, R.J. Gerrig, "Get Up and Win! ": Participatory Responses to Narrative. F. Biocca, The Evolution of Interactive Media: Toward "Being There" In Nonlinear Narrative Worlds. Part II:Real-World Impact of Narratives. J. DelFattore, Controversial Narratives in the Schools: Content, Values, and Conflicting Viewpoints. M.D. Slater, Entertainment Education and the Persuasive Impact of Narratives. J. Radway, Girls, Reading, and Narrative Gleaning: Crafting Repertoires for Self-Fashioning Within Everyday Life. R.N. Jacobs, The Narrative Integration of Personal and Collective Identity in Social Movements. Part III:Theoretical Perspectives. A.C. Graesser, B. Olde, B. Klettke, How Does the Mind Construct and Represent Stories? J.J. Strange, How Fictional Tales Wag Real-World Beliefs: Models and Mechanisms of Narrative Influence. R.C. Schank, T.R. Berman, The Pervasive Role of Stories in Knowledge and Action. M.C. Green, T.C. Brock, In the Mind's Eye: Transportation-Imagery Model of Narrative Persuasion. T.C. Brock, M.C. Green, J.J. Strange, Insights and Research Implications: Epilogue to Narrative Impact. "...the interdisciplinary perspectives from cognitive and social psychology, political science, sociology, rhetoric, cultural studies and media studies make the Narrative Impact an intellectually stimulating read. It sheds light on new theoretical frameworks and opens up exciting areas for empirical research in domains such as computer-mediated environments, film, media-effects research, entertainment-education, etc."